Dutch Dolphin On South American Apostle Spoon? Yes, you read the title correct it seems like a South American Apostle Spoon (Bolivia or Peru but most likely Bolivia) somehow made its way to Holland and it was stamped with the "Dolphin Mark" used 1859 to 1893 ___ This "Dolphin Mark" was used to designate silver which was below the standard of .833, but had a minimum fineness of .250, but interestingly I have read that "this mark was sometimes mistakenly used on old and foreign objects" so it seems as if this is the case here. The figures on the hollow handle remind me of a few pieces I have from Guatemala, so I did some research and my best theory is that this is an Apostle-type spoon from Bolivia, but I suppose I could be wrong and this is a Dutch spoon whose maker simply preferred to work in a lower silver content, perhaps .800 for some reason? Another theory is that the handle is actually from a small South American "Gaucho" knife and it has been re-purposed into a spoon because the handle really does look like a "Gaucho" type of knife. Could it be that a maker of "Gaucho" knives simply wanted to make a spoon? Re: Dutch Dolphin On South American Apostle Spoon? Another theory: This Is An Early Colonial American Silver Spoon from the time when the Dutch exerted a strong influence on the culture circa 1690. Apparently there were "funeral spoons" and they were given to pallbearers at funerals. Does the figure on my spoon look as if he is "bearing a pall" at a funeral? I really think the figure is a pallbearer, but I could be wrong. 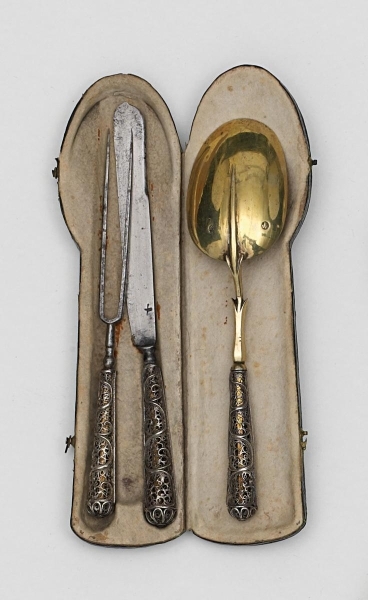 "According to Graham Hood in "American Silver" spoons such as the one pictured below "were frequently given to pallbearers at funerals and marked with the deceased's name, age, and the date." The spoon shown below dates ca. 1670-90 and belongs to the Yale University Art Gallery and is part of the Mabel Brady Garvan Collection. Spoons in this style are characteristically of Dutch descent. (This spoon is a very early American colonial spoon). Even though these spoons were once "frequent", Mr. Hood states that very few are known today." 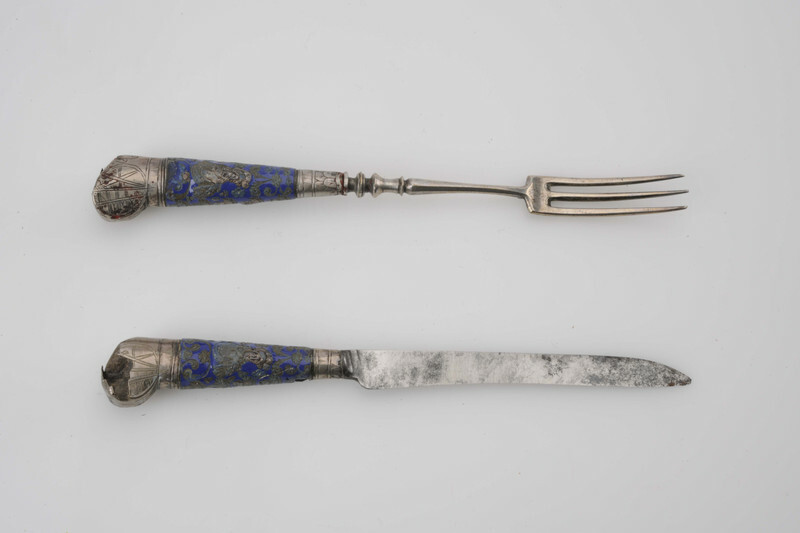 The early 18th century Dutch table knife handles were often octagonal shaped and later round. The finial appears to be apostle Paulus with sword. Originally it could have been a knife or two or three tine fork, the handle engraved biblical scene. Indeed I believe the spoon bowl and handle to be a marriage. Is the spoon bowl hand raised ? I am not sure but do not think so. I was just thrown off track by the engraving, I could find nothing at all like it. I still don't understand the engraving, it seems to look like a Native American (Narragansett Tribe possibly?) with half-shaved head and long hair in the back who appears to be bearing a pall for a funeral. Do you believe that this is actually a scene from the bible which somehow symbolizes marriage, is that the better interpretation? Another strange feature is that the base upon which the Apostle Paul sits is a cast element, a series of vines with space in-between the vines such that if you shine a flashlight on the base, light goes into the hollow handle itself, and these vines did remind me of that Augsburg handle. Do not know if the finial of apostle Peter is a later addition but it surly indicates Christianity. The simple engraving, the figure does he bear a pall for funeral, swung over one shoulder? Or does he bear the weight, part of a cross to become a good christian, to build churches to spread the true faith. The handle could be made 19th century. Sorry but I don’t think much of this spoon. Don't be sorry, I just realized a few minutes ago that it is the cross which is being shouldered, I don't know why that did not occur to me immediately. I know that genuine Apostle Spoons from 1500-1700 are extremely rare, so it makes sense that this is much more likely to be from the 19th century, but it is curious that it does not bear the appropriate hallmarks on the handle, but maybe the hallmarks were on the bowl which had been replaced at some point. An accurate interpretation of the design of the spoon is the most valuable thing because you can instantly assess the origin and date of a spoon when it crosses your hands, and that is the most valuable skill of all, much more valuable than any single spoon. The more threads we post, the more people we help when they find a certain spoon such that they can become more skilled.